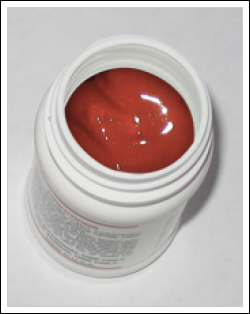 Dehorning paste typically contains two caustic substances: calcium hydroxide and sodium hydroxide. When applied to the horn bud, the paste causes a chemical burn that destroys horn-producing cells. A thin film about the size of a nickel is all that’s required. When horn-producing cells are destroyed, horns don’t grow. It’s as simple as that. Make no mistake: caustic paste is strong stuff. You definitely don’t want it running out of the application area (into the eye, for example), or getting onto other animals – or on you! That’s why it’s important to apply a protective ring of Udder Balm or petroleum jelly around the horn bud prior to application; wear gloves during application; and keep the animal indoors, out of rain and away from other animals, for six hours. You may also want to consider administering a topical anesthetic or sedative beforehand. Although paste disbudding has been shown to be less painful than hot-iron disbudding, it is still uncomfortable. On the other hand, don’t be alarmed if the animal doesn’t react to dehorning paste application. One of our guest bloggers, Jeanne Wormuth of CY Heifer Farm, usually dehorns 3 to 5-day-old calves when they’re relaxed after a big meal. She tells us some of the calves actually sleep right through the procedure. What have been your experiences with caustic dehorning paste? Morris, NY (March 8, 2011) – With increasing public interest in farm animal handling practices, a new Website – Dehorning.com – has been launched to share science-based information and facilitate discussion about cattle dehorning. The Website is sponsored by H.W. Naylor Company, Inc.
An explanation of the difference between dehorning and disbudding. Photos and information about various dehorning methods. Access to research articles, which visitors can vote and comment on. A blog about farm management practices and science-based research related to dehorning and early-age disbudding. Visitors to the site can subscribe to the blog via e-mail and RSS feeds, and join Facebook and Twitter pages. The site also invites producers, handlers, food retailers, veterinarians, researchers, academics and others with experience and interest in dehorning to become a guest blogger. About H.W. Naylor Company, Inc. Founded in 1926 by upstate New York country veterinarian Howard Naylor, the H.W. Naylor Company, Inc. is a leading manufacturer of topical medications for livestock, equine and companion animals. The company’s products, marketed under the brand name Dr. Naylor, include Dehorning Paste, Udder Balm and Hoof ‘n Heel. Learn more at www.drnaylor.com.